There may have been some disappointment on the part of Robert Gottschalk and his crew at Panavision that Raintree County was not showcased in a 70mm roadshow run. In late 1957 he announced the creation of a new division of the company that would independently produce 65mm films for roadshow treatment. The first film, slated to go before the cameras in May of 1958, was to be The Magnificent Matriarch from a novel about Hawaii, which was to be produced by David Lewis, who had just completed Raintree County. It would include scenes of volcanic eruptions and the first large format underwater shots made with a new 20 pound hand held camera. The announced aspect ratio was to be about 3:1, (indicating that producers still felt that unstriped 65mm prints would be preferable to 70mm mag prints in 1957), and Gottschalk stated that his system would not be allowed to be installed in theatres that could not use a minimum screen width of 60 feet. 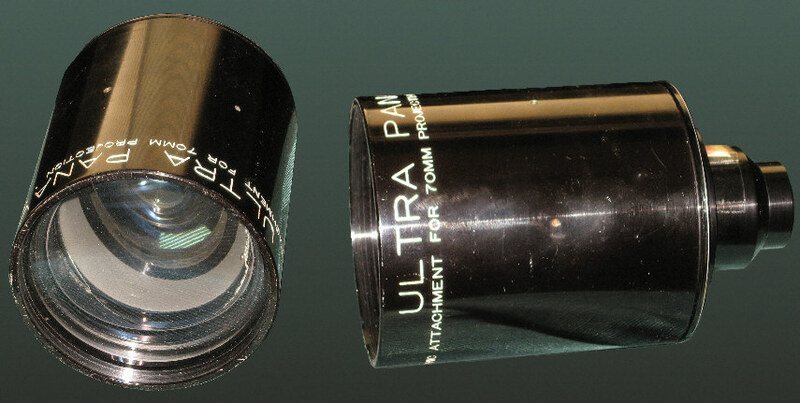 Furthering Panavision's involvement in the 70mm theatrical equipment field, the company introduced the Ultra Panatar variable anamorphic lens that could be used with either 35mm or 70mm films, and they marketed a 35/65/70 conversion kit for Simplex XL 35mm projectors. (The 65mm components would never see use in any conventional theater.) The Magnificent Matriarch never came to be and the new Ultra Panatar lenses would never be used with 70mm film because new fixed ratio projection lenses were ready for use when Ben-Hur premiered in November, 1959. The new Ultra Panavision 1.256x anamorphic projection attachments allowed much more light on the screen than the variable squeeze lenses. 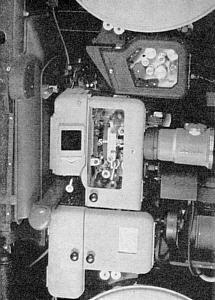 At right: the Panavision 35/65/70 conversion of a Simplex XL 35mm projector. The magnetic sound system was designed and manufactured by Magnasync. New screens were developed by Radiant, a company that had originally distributed Panavision's products to the industry in the early 1950's, and lamphouses were supplied by Ashcraft. A triple blade shutter was included in the conversion kit to reduce screen flicker. The Ultra Panatar lens is visible to the extreme right. 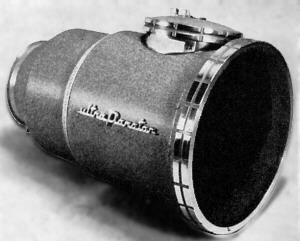 While the Ultra Panatar was adequate for 35mm anamorphic projection it wasn't optimum for anamorphic 70mm so a new projection adapter was developed for the roadshow presentation of Ben-Hur. This is the Ultra Panavision anamorphic projector adapter shown mounted to a small Steinheil prime lens which Panavision provided to theatres that didn't already have 70mm projection before Ben-Hur opened. The lens pictured above was shipped to the Coronet Theatre in San Francisco on December 14, 1959. Ben-Hur finally went before the new cameras and lenses in late 1958. Nearly a year was required for principal photography. A total of seven new and modified cameras were assembled with six being shipped to Rome and one held in reserve in Culver City, California. 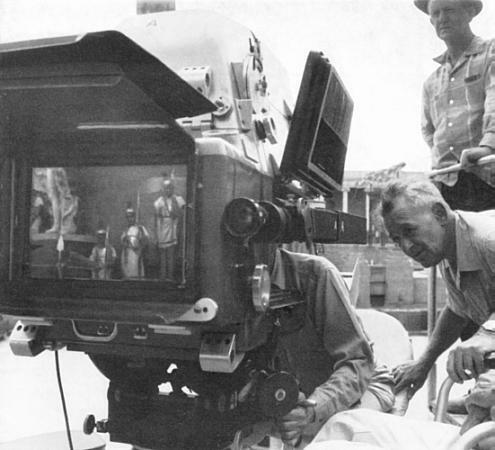 Director William Wyler and director of photography Robert L. Surtees (wearing hat) with the monster 65mm Panavision camera. The magnesium sound blimp on this camera weighed 300 pounds. The Roman soldiers are reflected off the optical glass covering the matte box. While not necessary for outdoor filming without sync sound, the blimp, once installed, generally remained a part of the camera for the duration. This is the production's "A" camera. The cosmetically beat up lens on the previous page was part of the lens set for this camera. Camera 65 photographs Gratus' entry into Jerusalem, moments before Tirzah's clumsiness screws up the lives of all the principals in the picture for the next 3 hours. Unquestionably one of the silver screen's most exciting, and technically perfect, action sequences. 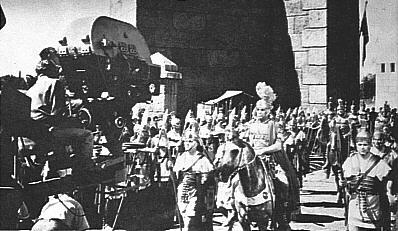 Two Camera 65 units, circa 1930 MGM Realife 70mm cameras modified for Panavision by Mitchell Camera Corp., photograph Messala and Ben-Hur racing to the death in the sand of the arena at Jerusalem. Note that Messala is racing at a disadvantage, having only three horses. No it's not done to fix the race, it's just to make it easier for the camera car to pace the chariots closely. Much of the photography of the chariot race was done at frame rates ranging from 16 to 20 frames per second to add to the excitement. Camera speeds were varied according to the direction the chariots travelled in relation to the camera. 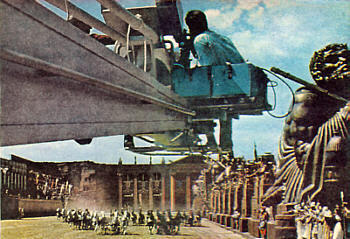 As the chariots would make the turn around the Spina, (that big thing in the middle of the arena with those gigantic statues), camera assistants would readjust the frame rate and shutter openings. William Wyler and Robert Surtees deservedly won Academy Awards for the film, but the race was directed by action specialists Andrew Marton and Yakima Canutt, and photographed by cinematographer Pietro Portalupi ASC, under the very close supervision of Robert Surtees. 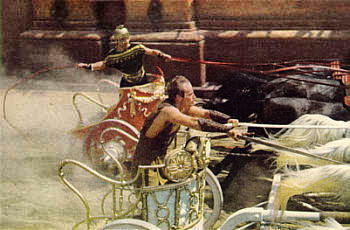 Wyler's touch is, however, very much present in the chariot race as he worked side by side with editor Ralph E. Winters to assemble this exciting sequence. Messala (Stephen Boyd) hated Judah Ben-Hur so much that his eyes changed from brown to blue during the race. What the set decorators couldn't provide, the talented matte artists did. 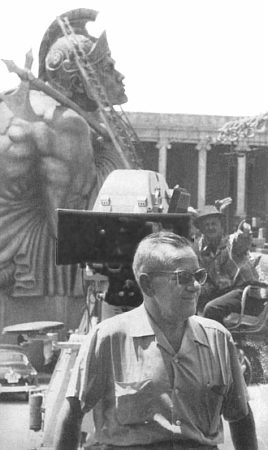 Live action filmed at the Cinecitta studios in Rome was merged with glass paintings done in Culver City, California, to reproduce ancient Rome and the Middle East in a very convincing way. Unfortunately, the blue screen traveling matte work did not fare so well.